Admittedly, I am more of a bandwagon fan than a loyal Seahawk supporter. Either way, I watched and enjoyed every snap of the Seahawks win yesterday. There is something great about your team winning. The game will not go down in history as the greatest, but it doesn’t matter much to the players or the fans. Victory is all that mattered. Victory always results in celebration. Within moments of the final whistle, the neon green and blue confetti began to fall upon MetLife stadium. 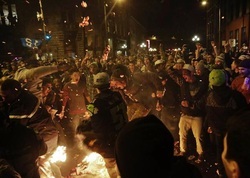 The city of Seattle erupted in party – one huge party. The last time the city experienced this kind of victory was 1979 when the Sonics won the NBA championship. It is reported that fireworks were launched as students celebrated on the campus of the University of Washington. Victory demands celebration. There is a parade coming to Seattle on Wednesday. People will line the streets, I’m certain there will be a few tears shed as the masses pay tribute to victory. But there will be defeat again. We will crave victory again. It may be fun to celebrate the moment, but it is only a moment. The Seahawks will not win the Super Bowl every year. There was a different victory, it was won on a Jerusalem hillside and as a result, defeat has been forever abolished. Listen to these words written by Paul in 1 Corinthians. “Death has been swallowed up in victory. Where, O death, is your victory? Where, O death, is your sting?” The sting of death is sin, and the power of sin is the law. But thanks be to God! He gives us the victory through our Lord Jesus Christ. Death has been defeated. Jesus is victorious. Sin has lost its power. Victory demands celebration.We do not celebrate enough. Maybe Heaven will be one big, everlasting celebration. What would our church look like if every Sunday we gathered together to celebrate victory? How would your morning change if you woke up breathing the air of victory? Would your perspective be different if you knew death has been defeated and will never see victory? Welcome to the new Oneighty Blog! Thanks for stopping by. I’ll to to keep this updated with pictures, news, and my thoughts. Here are a few pictures from our high school retreat this past weekend. The guys cooked dinner for the girls on Friday night. This is by far by favorite picture from the whole weekend! I’m not sure what Esther is doing…but it’s pretty funny.